It’s hard not to admire the optimism of Susi, a woman I spoke to as she sifted through what was left of her belongings, weaving her way between the punctured remains of her family home in Tanjung Lesung, Indonesia. Her home sits on the beachfront — one of many areas subsumed by the tsunami that swept over this coastline on the night of Dec. 22. Yet Susi did not lament her losses. Instead she was grateful that her house is, miraculously, still standing. Like the cautionary tale of “The Three Little Pigs,” her house of brick is the only structure remaining in a neighborhood where straw and wood were the default building blocks of houses largely constructed by the poor. An Indonesian soldier searches for the tsunami victims in Sumur, Indonesia, Tuesday, Dec. 25, 2018. In front of her relatively grand, two-story house is a wasteland of debris: rocks, coral, dead fish, rotting animals, coconuts, wood and straw. None of the houses of her 10 or so neighbors survived. The backing soundtrack for this devastation is the ever rumbling, grumbling and erupting volcano of Anak Krakatau. The so-called “Child of Krakatoa” is all that was left of the immense Krakatoa volcano after it exploded in the late 19th century, killing more than 30,000 people. Its illegitimate offspring emerged from the water between Java and Sumatra in the early 20th century and has been growing ever since. It has been erupting since June and scientists believe a chunk of the volcano sheered off and triggered this latest tsunami. 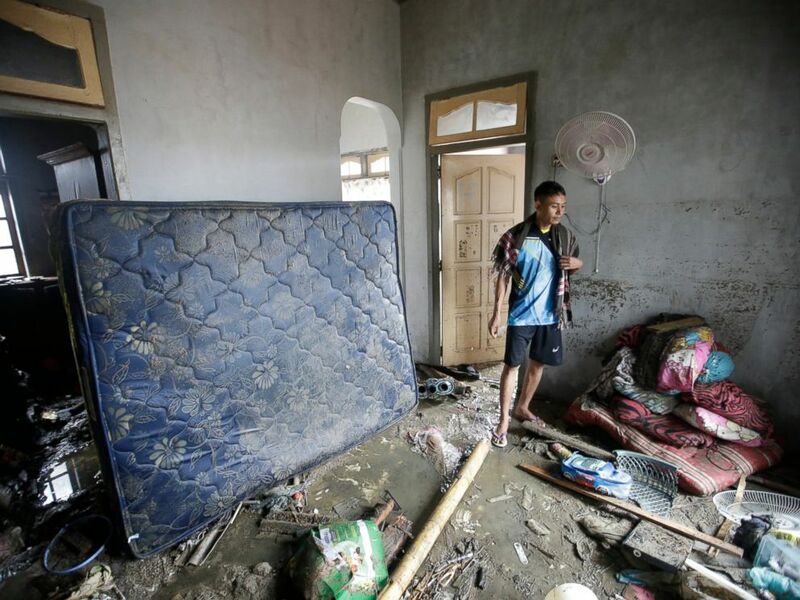 A tsunami survivor walks inside a house at a tsunami-ravaged village in Sumur, Indonesia, Tuesday, Dec. 25, 2018. 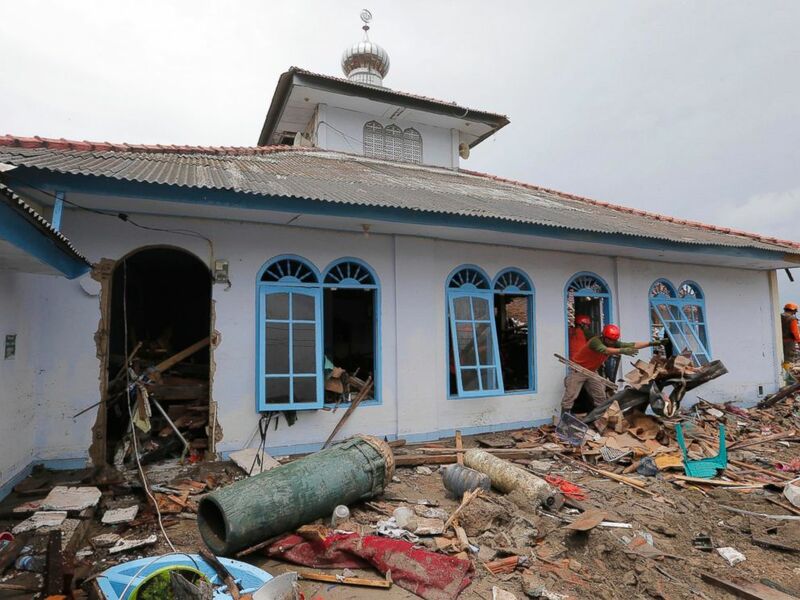 People clean up a mosque following the tsunami in Sumur, Indonesia, Tuesday, Dec. 25, 2018. Most tsunamis are started by an earthquake, which often gives people living in lowland coastal areas some warning. But an underwater landslide like this gives no indication of what is to come. A little over 20 minutes after it happened the tsunami swept over an entirely unsuspecting and ill-prepared coastline. Mobile phone footage at a concert by Indonesian pop band Seventeen captured the moment the wave crashed onto stage. Two members of the band, its manager and a member of the crew were killed. The lead singer’s wife is still missing. 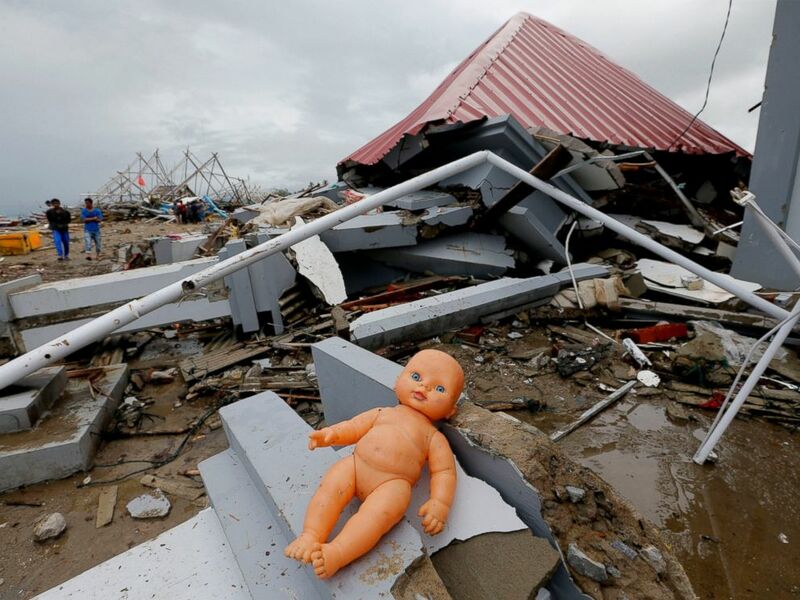 A doll lays outside a damaged house following the tsunami in Sumur, Indonesia, Tuesday, Dec. 25, 2018. All along the shoreline, people were forced to run for their lives with no warning. Today, it is littered with debris and the carcasses of lives and homes destroyed. Hundreds of rescue workers have poured into the area in a massive rescue operation. But as more days pass, this becomes more of a recovery mission. More than 400 people are confirmed dead, 1,400 injured and over 150 have been reported missing more than two days after the wave came crashing ashore. The threat still remains, as officials have warned residents and tourists to stay as far away from coastal areas as possible because of continued volcanic eruptions from Anak Krakatau, which could potentially trigger a second devastating tsunami. 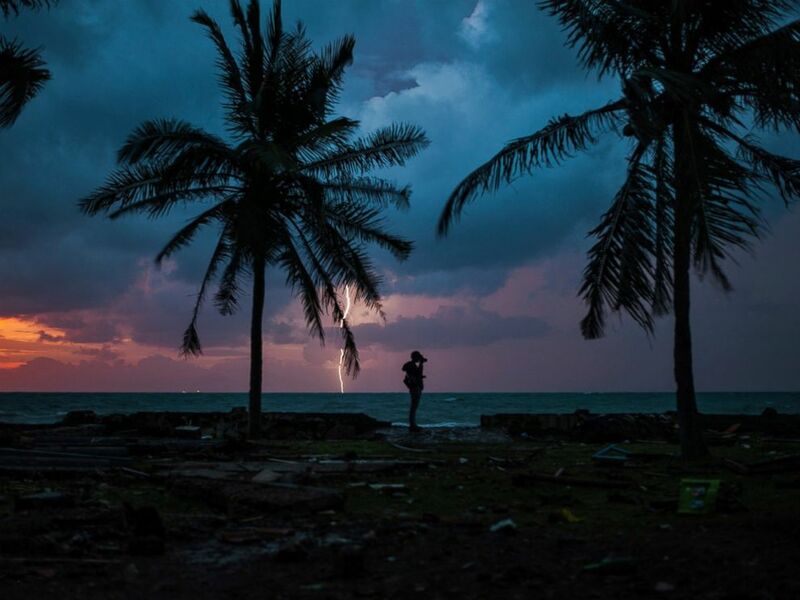 A photojournalist is silhouetted by the sunset as a lightning strike at a resort affected by Saturday’s tsunami in Carita, Indonesia, Tuesday, Dec. 25, 2018. 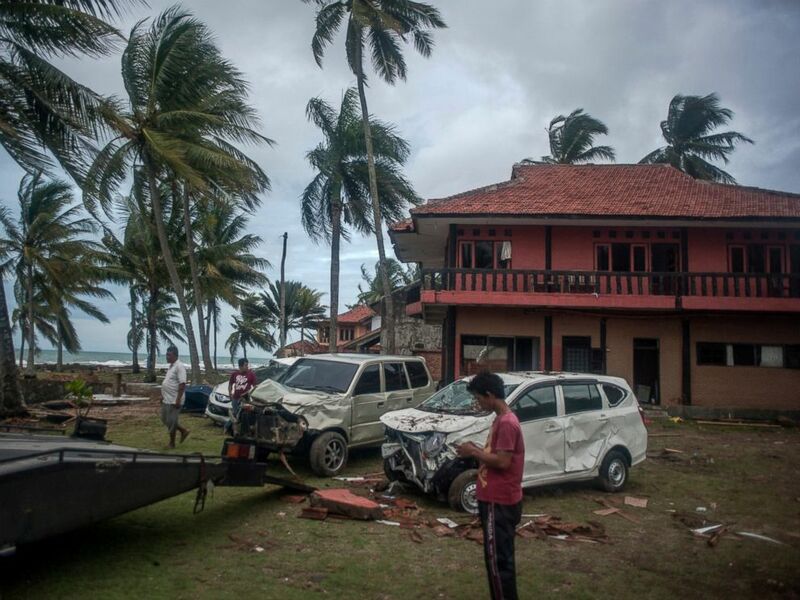 Owners reclaim their damaged cars from a resort affected by Saturday’s tsunami in Carita, Indonesia, Tuesday, Dec. 25, 2018. 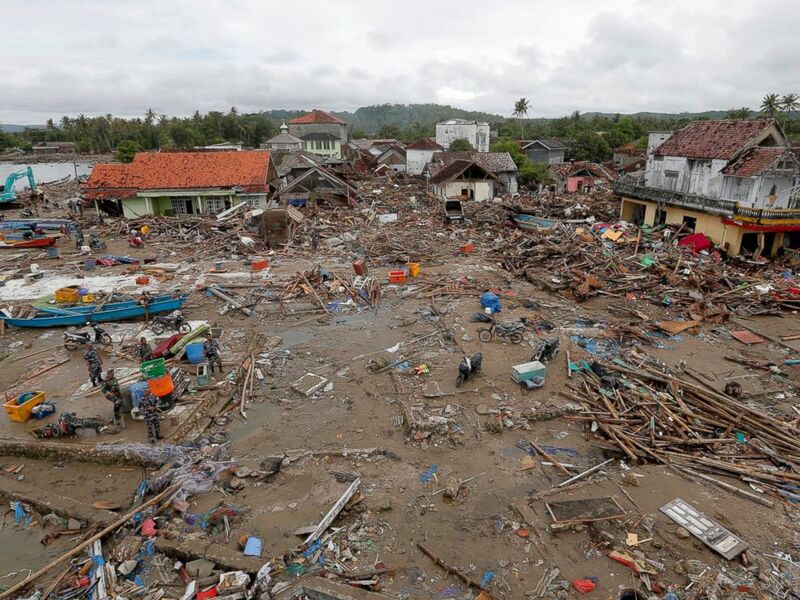 Indonesian officials have said that the tsunami early warning system did not work and has been out of action since 2012. They also revealed that only 70 of 170 such systems installed in the waters around Indonesia’s many islands are operable because of a lack of money for maintenance and vandalism. That means Susi and thousands of the country’s residents still have little or no protection against another tsunami sweeping to shore in the future. 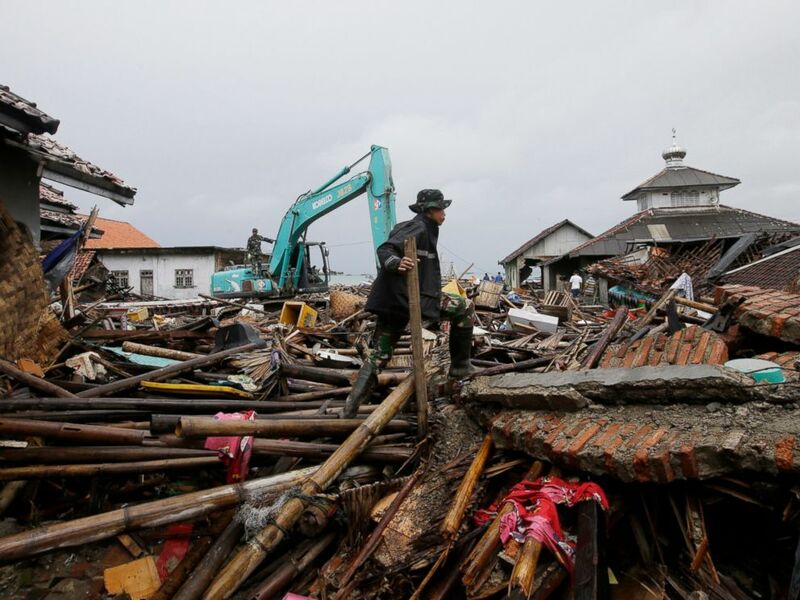 Soldiers inspect the damage at a tsunami-ravaged village in Sumur, Indonesia, Tuesday, Dec. 25, 2018.